It has been an amazing 3 days here in Tahiti with pumping surf, beautiful weather, and surrounded by the magical scenery that makes you feel like you are in a dream world, with today’s action proving to be the perfect way to end the 2015 #SapinusPro. Today dawned overcast, but with solid surf in the 6ft+ region, as Round 3 kicked off early, as the sun came out to provide a picture perfect scenario for the final day of competition. From the outset, Zane Schweitzer (Starboard) was a man on a mission, driving powerful carves in the pocket and finding more barrels than anyone, clearly here to make a statement in Tahiti at stop number 2 on the 2015 Stand Up World Tour. Zane won all his heats on his way to the final, clearly positioning himself as the man to beat, and building off the flashes of brilliance he showed back at Sunset in February. A victory has been long overdue for this young talent from Maui, as he hasn’t had a win since 2011 (the Hawaii Island Finals), except for a win at the Abu Dhabi All-Stars exhibition event back in 2013. After his win here in Tahiti, Zane now moves into 2nd place overall in the World Rankings with a 9th at Sunset and now a win here in Tahiti. He is looking stronger, fitter and more focused than ever, so watch out for this impressive talent as we progress through the 2015 season, sitting right on the heels of the new ratings leader. Caio Vaz (Art in Surf) narrowly missed out on a World Title in 2014, just falling short in an immensely close battle with Kai Lenny (Naish) that went right up until the last day of the season. This year, things seemed to start the same way, with Caio and Kai once again meeting in the Final, with Kai having the edge to take the win. 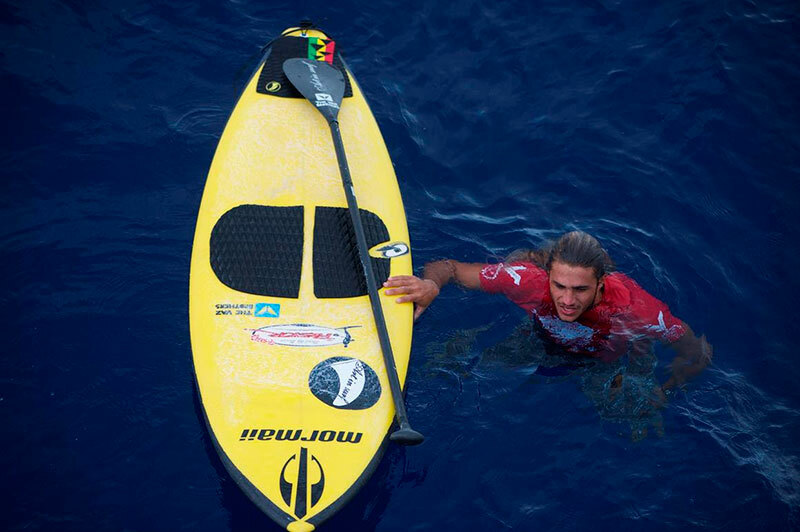 However here in Tahiti, with Kai going down in the 2nd round, the door was left open for Caio to capitalize, and that he did and then some, with some impressive surfing from start to finish and a well thought out contest strategy that saw him outplay his opponents all the way to the final. At the midpoint of the final, it seemed that everything was playing in Caio’s favor, with a couple of solid scores and leaving Zane with a lot of work to do. Unfortunately for Caio, Zane continued to plug away, posting higher and higher scores, before finding the perfect wave he had been waiting for to unleash some powerful carves and allowing him one of the only barrels on offer during the latter part of the day. While Caio was disappointed not to take a win here in Tahiti, his 2nd place finish propels him to the top of the Rankings after stop number 2 and before he heads home to Brazil in August for stop 3. Given his track record in Brazil and his current momentum, this could be the start of something big for Caio Vaz in 2015. Everybody loves an underdog story and there is none better than that of Daniel Kereopa from New Zealand. 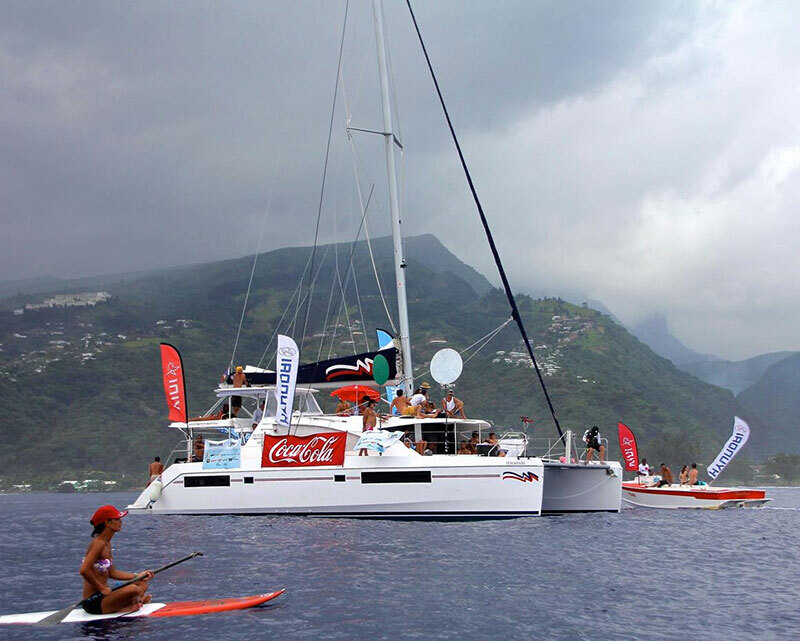 Having launched a crowd funding project to be able to make it to his first World Tour event here in Tahiti, he arrived with everything to prove. First the trials, and he already made his presence felt, making it all the way to the Finals to post a 3rd place finish. Once in the main event, it was time to step it up, as he was now up against the World’s very best…. This didn’t seem to phase this impressive talent from New Zealand, as he unleashed heat after heat of solid surfing and competitive prowess to get him all the way to the semi finals. 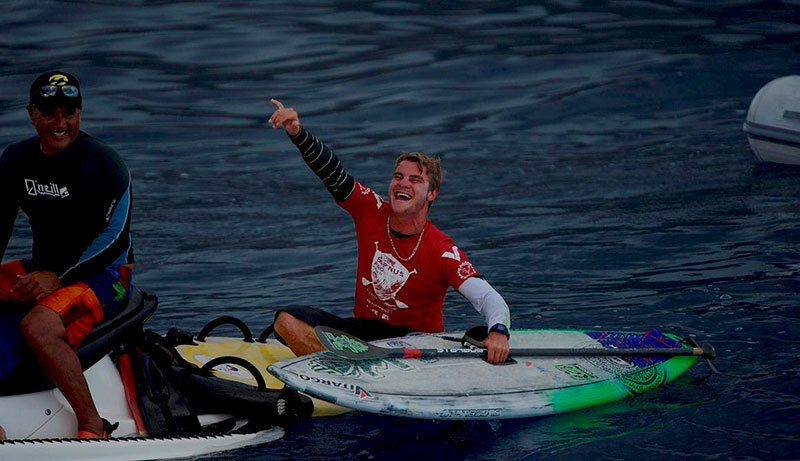 While he couldn’t overcome the seemingly unstoppable Zane Schweitzer (Starboard), he has made his mark and shown that he has what it takes on the global stage. After his standout performance here in Tahiti, there is no doubt that Daniel will be a serious talent to watch out for this year on the Stand Up World Tour. Sean Poynter (Starboard) finished 2014 on a high, with a win at the La Torche Pro France, a 3rd place finish overall and then another win at the Location X exhibition event in Morocco. Sunset didn’t turn out as Sean would have liked, but coming back to Tahiti, an event that he won back in 2012, instilled confidence in the all American champion, as he set about his business and made it all the way to the semi-finals. A familiar battle then ensued between Sean and Caio Vaz (Art in Surf), with Caio getting the better of Sean forcing him to settle with a 3rd place here in Tahiti. His 3rd place here boosts him back up the rankings into 6th place overall, momentum that he will be looking to build off going into the next event in Brazil, as he will have his eyes set on a World Title in 2015. After what has been an epic event here in Tahiti, it is all change here on the World Rankings, as we see Caio Vaz (Art in Surf) shoot up to 1st overall and Zane Schweitzer (Starboard) to second after his win here in Tahiti. Meanwhile, 4x World Champion Kai Lenny (Naish) moves down to equal 3rd place after a disappointing finish here in Tahiti, where he is met by the young phenom Mo Freitas (Focus SUP) who posted another great performance here at the #SapinusPro, finishing in 5th, and putting him in 3rd place equal overall.